The next two years after Neil Armstrong's and Buzz Aldrin's triumphant moonwalk were a very difficult time for NASA's manned space program. Administrator Tom Paine and Vice President Agnew were at first optimistic about the chances of getting their ambitious post-Apollo space exploration plan approved. But it wasn't to be. Paine's $4.5-billion FY 1971 budget request was quickly pared down to just $3.333 billion by the White House. Congress later reduced this only slightly, to $3.269 billion, but only after three difficult roll-call votes. In fact, the House space subcommittee chairman, Joseph Karth, actually opposed NASA's $10-billion shuttle/space station plan because he felt it would force the agency to cancel many unmanned programs. Disgruntled space scientists such as James van Allen and long time opponents of expensive manned spaceflights such as Democratic Senators William Proxmire and Walter Mondale supported him. Karth's May 1971 amendment to cancel all funding for NASA's shuttle & station studies was a 53-53 tie, the closest he could come without winning. The White House was equally unsupportive, and Paine decided to quit his job in September 1970 following numerous disagreements with President Nixon's budget officials. His final action was to cancel the Apollo 18 and 19 manned lunar landing missions in order to save money for additional space shuttle studies. NASA now focused all its future efforts on the shuttle after the space station, space tug and nuclear Mars vehicles all fell by the wayside during 1970. Then, in May 1971, Nixon's Office of Management and Budget dropped another bombshell by announcing that NASA should not expect a larger annual budget than about $3.2 billion over the next five years. The fully reusable Phase-B shuttle was all but dead since it would have required a budget increase to $4.5-5 billion. NASA and its contractors would spend the next six months frantically searching for cheaper partially reusable alternatives. The most important Phase-B prime and double-prime results were as follows. McDonnell-Douglas received a $0.75-million contract extension in March 1971 to investigate the impact of Grumman's drop tank concept on its Phase B shuttle design. The extension, plus an earlier structures contract worth $2M, increased the total Phase B contract to $10.9 million. 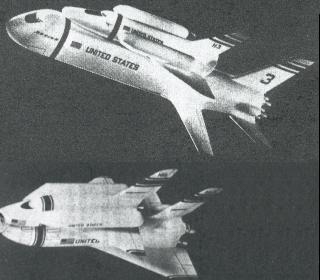 North American Rockwell's Phase-B shuttle contract was also extended to cover the Grumman drop-tank concept (left). In June 1971, NASA's new Administrator, James Fletcher, advocated the H-33 drop tank design with staggered development to reduce the peak funding requirement from $1.8B to $1.3B per year. The orbiter would be developed first and initially flown atop an existing expendable rocket stage. In late June, Fletcher extended the Phase-B contracts yet again, this time by four months and about $2.8 million per team. Each contractor was ordered to evaluate different expendable boosters plus a shuttle orbiter that carried its liquid hydrogen *and* liqui d oxygen propellants in an external tank. North American Rockwell investigated the Saturn S-IC (right) and a stripped-down expendable wingless version of its Phase-B booster. Martin Marietta proposed an uprated version of its Titan IIIM rocket. The "Titan IIIL" would have incorporated four solid rocket boosters and “stretched” propellant tanks to carry a full size shuttle orbiter plus 29.5t payload. Martin claimed their rocket only would cost $30 million per launch vs. $75 million for the Saturn S-IC. Although the LS-200 design was shelved, Lockheed still received about $350,000 a month to continue working on drop-tank orbiter & solid rocket booster configurations. The Lockheed designs were to be based on the Manned Spacecraft Center's "MSC-040" concept from May 1971, which turned out to be essentially the same configuration as the shuttle concept NASA selected six monts later. Boeing and Grumman were thought to be in an excellent position to land the future shuttle production contract since their innovative proposals greatly influenced NASA's plans during 1971. The June 1971 contract extension allowed the companies to investigate the Saturn S-IC interim booster concept (right) as well as various combinations of drop tanks and solid rocket boosters (left). 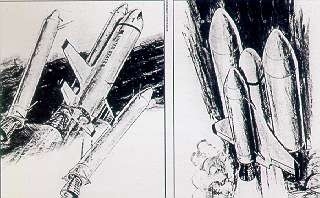 The concepts in the middle would have utilized combinations of liquid rocket boosters and expendable propellant tanks. 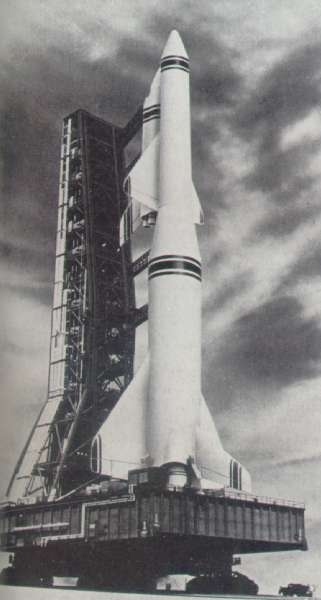 Boeing unveiled another ingenious shuttle booster design in August 1971. The "RS-1C" configuration (bottom) would have put wings, landing gear & jet engines etc. on the Saturn V rocket's S-IC stage, transforming it into a manned flyback booster for the shuttle! 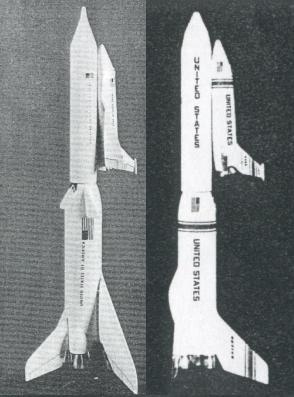 It would cost less to develop than the H-33 configuration's "B-2" booster (top). 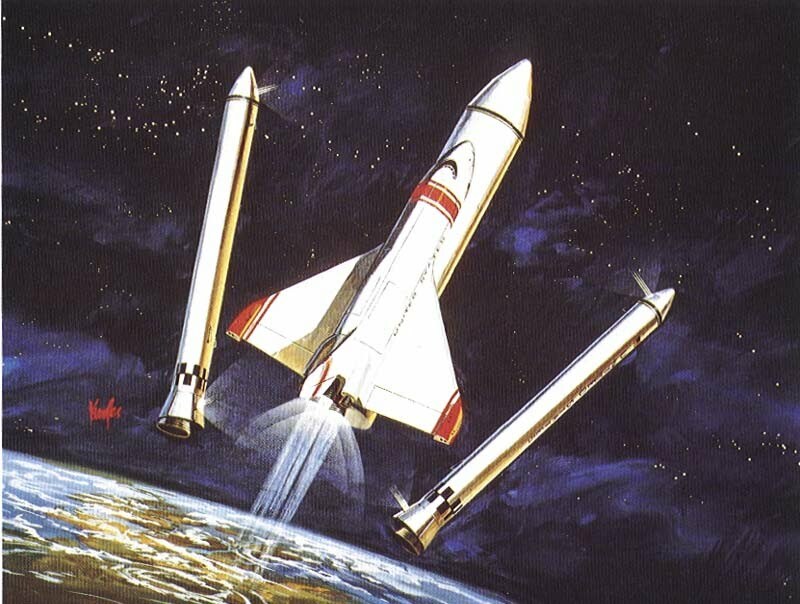 To further reduce the peak funding requirement, Boeing also proposed a "Mark I/Mark II shuttle" development program. During the Mk.I phase, the orbiter would use J-2S engines, ablative thermal protection and other off-the-shelf systems from project Apollo. Eventually, new hardware such as the Space Shuttle Main Engine and reusable thermal protection system would be introduced during the "Mark II" program to reduce the cost per flight and increase payload performance. NASA estimated that the "Mark I" shuttle would cost $9 million per flight, falling to $5.5 million for the improved "Mark II". NASA was unable to choose a booster when Phase B Prime ended in September 1971 and the contractors also recommended different solutions. Marietta Marietta felt its Titan III derivative shuttle booster was the most cost-effective alternative while Boeing & Grumman recommended the Saturn S-IC option. Lockheed and McDonnell-Douglas advocated a cluster of 4-meter diameter solid rocket boosters, but McDAC also felt the Titan IIIL could work... But all three options were within 15% of each other in terms of costs so NASA requested additional information. In October 1971, NASA augmented the McDAC, Grumman, North American Rockwell contracts by $6 million until April 1971. Lockheed received $3 million. An important change was all orbiter propellants (LH2 and LOX) would be carried in an expendable tank to further reduce the size and development cost of the shuttle. 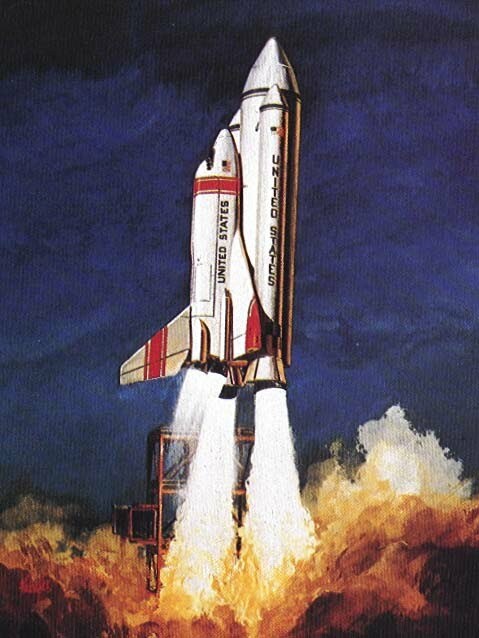 One of the preferred booster options was the Saturn-derived manned flyback design. North American Rockwell's "B-18E" (left) and Boeing's final flyback S-IC versions are depicted here. But the winged booster option was finally abandoned in December 1971 on grounds of cost and complexity. Its F-1 engines were not designed for reusability (the predicted lifetime was 10 flights) and NASA estimated they would have to be removed after each flight and the turnaround time was 10 days -- considerably longer than NASA originally had planned. The agency also decided to drop the "Mark I/II" plan since it would have stretched the development program until 1983 while mostly deferring costs rather than reducing them. Another problem was that the Mk.I payload carrying capability would have been greatly reduced, e.g. the polar orbit payload target was only 11,340kg vs. the US Air Force's 18,144-kilogram requirement. Parallel expendable solid rocket motors. Proposed concepts:  McDonnell-Douglas/Martin Marietta,  North American Rockwell/General Dynamics,  Grumman/Boeing. Parallel recoverable pressure-fed liquid rocket boosters. McDonnell-Douglas/Martin Marietta,  North American Rockwell/General Dynamics,  Grumman/Boeing. A single recoverable pressure-fed liquid rocket booster. McDonnell-Douglas/Martin Marietta,  North American Rockwell/General Dynamics. A single recoverable liquid rocket booster derived from the Saturn S-IC stage. Grumman/Boeing. The contractors reported their findings and recommendations in February 1972. Boeing recommended its own S-IC stage with retrorocket/parachute recovery at sea and also urged that solid rocket motors should be eliminated from further consideration. Lockheed and McDonnell-Douglas (who initially was quite optimistic about the pressure-fed booster) again advocated solids, noting that expendable Thor, Delta, Titan & Scout solid rocket motors had a very good safety record. North American Rockwell again refused to pick a favored concept and only noted that a case could be made for either solid or liquid boosters depending on what cost goals were most important. Space Shuttle solid rocket booster separation. NASA finally decided what type of booster it was going to use in March 1972: recoverable solid rocket boosters (SRBs)! The SRBs would be slightly more expensive per flight but the development cost and risk was lower than for the pressure-fed "big dumb booster" option. Both options had their share of problems, though. The pressure-fed booster was anything but simple since it would have to be very big, require thick-walled propellant tanks and welds several centimeters thick. No large recoverable booster had ever been built before and NASA was not sure if the required technological capabilities existed. Another concern was: what happens if a tank ruptures during ascent? All engines would shut down, with disastrous consequences. The solid rocket booster had a totally different problem since it could not be shut down until all the propellants had burned out! But at least the aerospace industry had some previous experience with large solid rocket motors although NASA's test firings of 4m and 6.6-meter diameter engines had ended in 1967. NASA claimed a handful of tests with the Titan III solid rocket boosters had "proved" the spent casings could be recovered from sea and refurbished for 10-20 reuses. But the decision would come back to haunt the agency 14 years later. So the Space Shuttle configuration finally evolved. Its far from sleek appearance was the result of an almost continuous juggling of compromises. The project's many critics often regarded the ungainly craft as a "camel" (an animal obviously designed by a committee), but it did come close to meeting the staggering array of payload requirements, cost trade-offs, crossrange specifications, schedule and budget constraints and operational conditions that shaped it. But as NASA Deputy Administrator George Low warned in a speech before the National Space Club on February 17, 1972, the real challenge was to develop a "productive Space Shuttle" -- "one that performs as required, can be developed at a reasonable cost and is economical to operate. If we meet the first two of these objectives, but not the third, we will have developed a white elephant." The next chapter will examine the economic case for the Space Shuttle.